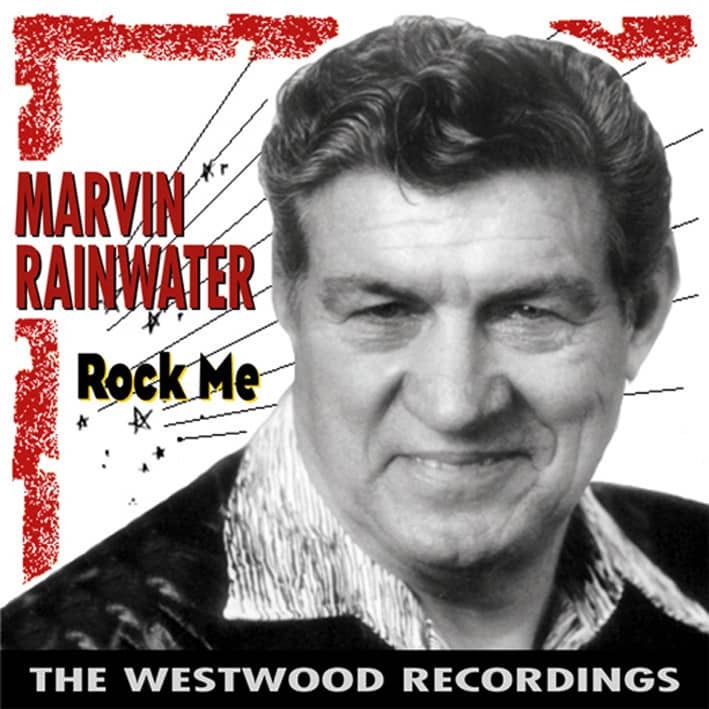 I f you peruse 'Billboard's' Charts, you will notice that Marvin Rainwater had 4 chart entries on the U.S. country charts and one top forty hit on the U.S. pop charts. This information only serves to confirm that chart statistics are not the only guide to quality and longevity in the country and rock 'n' roll business. In reality they have little to do with a performer's talent and appeal. Like many older artists still thrilling audiences of all ages in the U.S.A. and Europe, Marvin's reputation is firmly built on his fifties recordings that have established his credentials as both a country and rock 'n' roll performer. But as I found out many years ago, his repertoire was quite different when he toured in the seventies. More on that later. 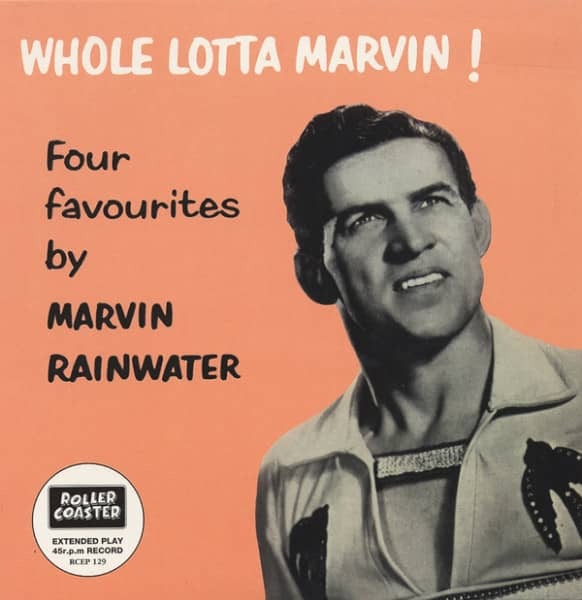 The Marvin Rainwater story has been covered in detail in the book accompanying the 4-CD boxed set 'The Classic Recordings' (BCD 15600) and the single CD 'Whole Lotta Woman - Rockin' Rollin' Rainwater' (BCD 15812). However for newcomers, he was born Marvin Percy Rainwater in Wichita, Kansas on July 2, 1925. After a stint in the Navy, he made tentative steps towards a singing career leading to appearances on the Arthur Godfrey Talent Show in 1955 after he had I Gotta Go Get My Baby out on Coral Records. He won! A contract with MGM Records followed and after a bunch of fine unsuccessful releases he scored his biggest U.S. hit in 1957 with Gonna Find Me A Bluebird which went to #3 country and #18 pop. A duet with then-unknown Connie Francis followed (The Majesty Of Love) and in 1958 came his big overseas smash, Whole Lotta Woman. Although it was only a minor hit in the States, it went to the top in England, resulting in Marvin's first visit to Blightly. While in England he recorded 2 titles, Dance Me Daddy and I Dig You Baby, the latter achieving a #19 chart placing in June of 1958. The '60s saw a downturn in his commercial success despite the fine quality of his recordings for Warwick, Brave, United Artists and Warner Brothers. Return visits to the United Kingdom in the '70s saw performances at country music venues when, as yet, the rockabilly revival had not caught on. On one such tour I first saw the Rainwater magic at the Empire Theatre, Sunderland on Tuesday 17th April 1973. Strangely his show at that time comprised of only three of his recordings, Gonna Find Me A Bluebird, Whole Lotta Woman and The Troubles My Little Boy Had, this in spite of audience calls for I Dig You Baby and Halfbreed. The bulk of the songs were far better known via recordings by other artists, and probably reflected the show he gave back home. He had opened with Jambalaya followed by Running Bear and on to Peter LaFarge's Ballad Of Ira Hayes which he told the audience he had just recorded. The Merle Haggard catalogue was mined for Okie From Muskogee and Mama Tried and there was a tribute to Johnny Cash with a medley of I Got Stripes, Ring Of Fire, I Walk The Line and Folsom Prison Blues, much to the delight of the audience. Other highlights were Billy Grammer's Gotta Travel On and a new ballad I Don't Care About Tomorrow. Always a joker, he introduced Running Bear with the comment "Since the indians tore my clothes off they call me ..." Yes, you've got it! In 1975 he was back, deputizing for the ailing Leftly Frizzell at Mervin Conn's International Festival of Country Music at the Empire Pool Wembley. There he scored a genuine triumph informing the audience, "I'll tell Lefty that he went down real well!" By the tail end of the '70s, Marvin was trawling his own catalogue to a much greater degree than in 1973. By the time we met up again for an interview for my 'North Country' show on BBC Radio Newcastle in November 1979, he had started to include some of his obscure MGM and Warwick material like Mr. Blues and Boo Hoo. When I say "obscure", I mean to the general country music fan who had been the main intended customer for his show in 1973. The Wembley Festival beckoned again in 1981 and once more he delighted the audience with his joyful mix of country and rockabilly. One of the highlights of the set was his version of Teddy Bear. Again I interviewed him for my radio show and we discussed the missed opportunities that had haunted him through the years. In reality though, he has survived the music industry better than most. He's still out there touring in the U.S. and the U.K. where he topped the bill at Willie Jeffery's Hemsby Rock 'n' Roll Weekender in 1999, receiving rave reviews in the process. Customer evaluation for "A Whole Lotta Marvin 7inch, 45rpm, EP, PS"